MADRID – Since the official start of Brexit negotiations last month, attention has been focused largely on the most contentious issues: how much the United Kingdom owes to the European Union, whether the UK will remain subject to the jurisdiction of the European Court of Justice (ECJ), and what rights British residents of the EU and EU residents of the UK will retain. 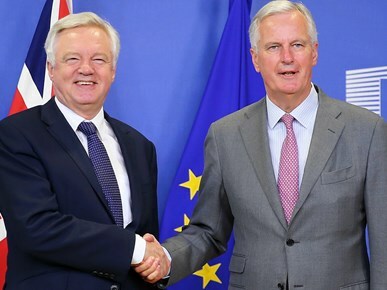 Given this focus, not to mention the UK’s history of aloofness and even disruption in relation to the EU, it is perhaps unsurprising that EU leaders view the UK as a hostile negotiating partner, lacking any real commitment to cooperation. In fact, the interests of the UK and the EU are closely aligned, particularly in three vital and interconnected areas: foreign affairs, security strategy, and defense policy. Finding a way forward on these issues, which have so far received little attention, might be the key to creating the cooperative frameworks needed to address the most controversial matters. In her letter formally notifying European Council President Donald Tusk of the UK’s intention to withdraw from the EU, British Prime Minister Theresa May identified both economic and security cooperation as the key elements of the “deep and special partnership” that she hopes to agree with the EU. But May should recognize that, while economic and security cooperation are equally important, they are not two sides of the same coin. Economic cooperation entails a solid set of pre-agreed rules guiding the functioning of the internal market, establishing community obligations, and protecting the free movement of goods, capital, services, and labor (the EU’s “four freedoms”). And that framework is subject to the binding decisions of the ECJ. In terms of security cooperation (and its analogues, defense and foreign policy), obligations are softer and institutions are less developed. In short, the system is still incipient. This lack of solid rules and requirements can hamper action because the relevant governments must reach consensus on each issue affected. But it can also enable action, because the parties are not constrained by rigid requirements. The resulting flexibility should, in theory, make it easier to find ways to ensure that cooperation works for all. For the EU, partnership with the UK brings demonstrable advantages. Britain boasts a world-class and readily deployable military, permanent membership of the United Nations Security Council, a nuclear deterrent, and a robust relationship with the United States. More fundamentally, its experience as a global power gives it a broad perspective that the rest of the EU both largely lacks and urgently needs as it attempts to become a global actor in its own right. The EU’s soft-power obsession has its share of pitfalls. But at a time when the world is moving toward increasingly multi-layered and networked governance mechanisms, the ability to bring a variety of actors to the table – which implies influence over who gets a seat – is a valuable commodity. Official cooperation also spurs informal coordination. The UK recently saw firsthand the consequences of going it alone. Mauritius, a former British colony, brought before the UN General Assembly a longstanding territorial dispute over the strategically valuable Chagos Islands, the site of a British-US military base. In a major diplomatic blow to Britain, the General Assembly voted to refer the case to an international tribunal. Though the dispute has important implications for European and global security, only four EU members joined the UK, the US, Japan, and South Korea in opposing the resolution. Twenty-two EU members abstained, including all of the major continental powers. To avoid being hung out to dry in the international arena, Britain needs the EU no less than the EU needs Britain. The question now is how to design a framework for the relationship, once the UK is no longer an EU member. Allowing the UK to remain involved in formal EU decision-making is not an option, as it would diminish the value of membership. But losing a vote need not mean losing a voice. The model that it usually cited is Norway, which liaises with the EU on foreign policy, but is not in the room when key decisions are made. But the weakening of the UK’s ability to shape decision-making under such a framework would be bad for both sides. Instead, a future arrangement could entail the secondment of UK staff to the EU External Action Service, as well as UK participation in the European Union’s powerful ambassador-level Political and Security Committee, which shapes much of the EU’s foreign policy. The EU’s counter-piracy initiative Operation Atalanta could also keep its headquarters in the UK. Such an approach would help to clear the air between the two sides, laying the foundations for stronger, trust-based cooperation in other areas. But, given EU leaders’ current lack of faith in the UK’s will to cooperate, it will be possible only if May’s government takes the lead. Security, defense, and foreign policies are too important to be treated as bargaining chips in a negotiation focused on economics. Instead, they should be placed at the top of the agenda, with negotiators seeking to establish a framework for mutually beneficial cooperation early on. The ball is in May’s court.